Growing up in a community filled with diversity has positively influenced Bill Porter’s life. It helped formulate his passion to serve others equally. As a partner in ownership with Porter Funeral Homes and Crematory, Porter has helped families in the metropolitan area get through some of the most difficult times of their lives. When he’s not working in the family business, he spends countless hours serving the community of Kansas City, Kansas. 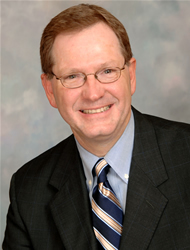 He is on the board of directors for Hospice of Kansas City, a member and past president of the Rotary Club of KCK, past president of the YMCA and Cancer Action, and on the board of trustees for Trinity Methodist Church. He also is active in the Mission Project, an organization that teaches independent living skills to adults who have disabilities. He uses his professional expertise to give talks on the subject of grief and death at churches and schools. For his distinguished service to the community, the YMCA named him “Man of the Year” in 1989. Growing up in the KCK Public Schools, Porter remembers being challenged by the high expectations of his teachers. They were constantly encouraging him to live up to his potential, and today he is grateful. They gave him reasons to believe in himself. Being a child in the 1960s was somewhat difficult, Porter recalls. Some of the country’s greatest leaders, Martin Luther King, Jr., John F. Kennedy, and Bobby Kennedy, were assassinated. The country was speaking out against the Vietnam War. There were race riots. “It was an interesting time. We were all just trying to figure out who we were, and what we were,” Porter said.